the quality of products, we will do third-party testing on raw materials, including pesticide residue and heavy metal. 1. Wheat grass powder is rich in dietary fiber, it can stimulate the intestinal peristalsis, so it can treat constipation very well. 2. Wheat grass powder is rich in antioxidant enzymes ---Pre-SOD; it has an excellent antioxidant effect and helps people keep skin soft and whitening. 3. 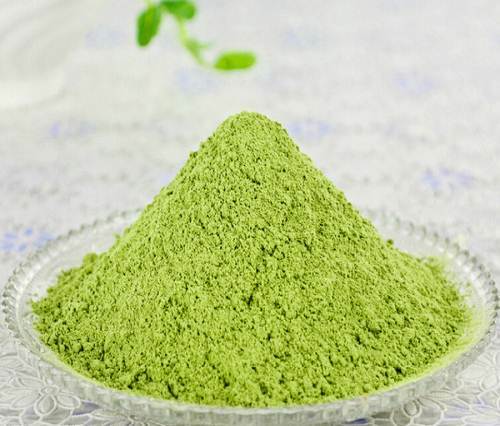 The powder from wheat grass contains a lot of vitamin C, beta-carotene, it can ameliorate the acidic physique, purify the blood and promote metabolism of the body. 4. It can also reduce blood cholesterol, triglycerides, this makes it popular for obesity prevention.